Michigan’s karst region is spread across Presque Isle, Alpena and Montmorency counties in the northwest corner of the Lower Peninsula and the heart of it is the Sinkhole Area, a non-motorized, 2,600-acre slice of the Mackinaw State Forest between Onaway and Atlanta. The Sinkhole Area includes the Sinkholes Pathway as well as a portion of the High Country Pathway, three lakes and four rustic state forest campgrounds. In other words there are numerous opportunities in this recreational playground to hike, mountain bike, swim or cast a lure for northern pike and smallmouth bass. Michigan’s karst region is spread across Presque Isle, Alpena and Montmorency counties in the northwest corner of the Lower Peninsula and the heart of it is the Sinkhole Area, a non-motorized, 2,600-acre slice of the Mackinaw State Forest between Onaway and Atlanta. A karst is a geologist's term for a limestone region where underground streams dissolved the rock into a series of large circular caves. These caverns eventually collapse under the overwhelming load of sand, rock and clay left by the last glacier 10,000 year ago and the result is deep conical depressions throughout the forest called sinkholes. The Sinkhole Area includes the Sinkholes Pathway as well as a portion of the High Country Pathway, three lakes and four rustic state forest campgrounds. In other words there are numerous opportunities in this recreational playground to hike, mountain bike, swim or cast a lure for northern pike and smallmouth bass. Sinkholes Pathway is a 2-mile loop around five sinkholes with a crossover spur that allows you to shorten the route to 0.75 miles. To extend the mileage, especially if you’re a mountain biker, begin with a portion High Country Pathway, an 80-mile trail system spans four counties; Presque Isle, Cheboygan, Otsego and Montmorency. 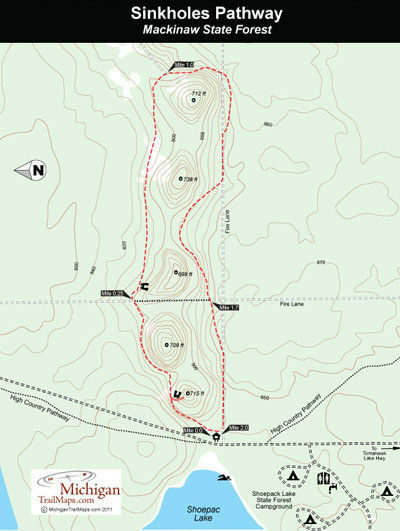 From Tomahawk Lake Campground, High Country Pathway heads north and within a mile reaches the trailhead of Sinkholes Pathway, turning the pathway into a round-trip outing of 4 miles. From Tomahawk Lake Highway, 2.2 miles east from M-33, turn north on a dirt road posted “Shoepac Lake Campground.” In a mile this road leads past the entrance of the rustic campground and then reaches a parking area within view of Shoepac Lake, which is really a sinkhole. The trailhead for Sinkholes Pathway is located across the dirt road. You can see the first sinkhole from the trailhead and from here the pathway begins by skirting its northern rim. 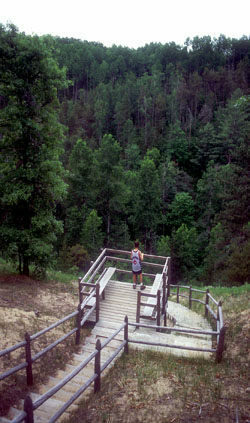 In a couple hundred yards the trail comes to an observation deck and junction with a spur into the 100-foot deep sinkhole. For the most part the spur is a stairway of 180-steps and three benches to the bottom of this forested pit. The view from the floor of this geological oddity is unusual but also a knee-bending climb back up to the pathway. From the stairway, you skirt the rim of the second sinkhole and then in a quarter mile from the trailhead arrive at the junction with a crossover spur that shortens the hike to less than a mile. The pathway continues east and immediately arrives at the third sinkhole, this one featuring an observation platform but not steps to the bottom. Before you race down into it, keep in mind it's a tough climb out without a stairway. You then swing away to cross an area of scattered pines, the result of a 1939 forest fire, then arrive at a log fence that marks the fourth sinkhole with the fifth and final one quickly following. At Mile 1 you arrive at a junction. Head right and follow the blue dots as the pathway climbs a wooded hill and then remains in the thick forest after topping out. You stay above and out-of-view of the fifth sinkhole for a short spell until the trail swings sharply west and begins its return to the parking lot. At Mile 1.3 the pathway passes the south edge of the fourth hole and then swings inland. It’s easy at this point to unwittingly continue on the fire lane, that appears like a wide, arrow-straight trail. At Mile 1.7 you reach the junction with the crossover spur, and then finish the hike by rounding the south side of the first two holes and viewing the sandy edge on the other side where you were just an hour or two earlier. In the last quarter mile, the pathway follows the fire lane and you can look down what is now a straight trail and see the shimmering waters of Shoepac Lake. Eventually you arrive at the forest road where to the north is the trailhead for the Sinkhole Pathway, to the south is High Country Pathway or straight ahead is a beach and the cooling waters of Shoepac Lake. If the day is hot, it’s hard to resist the temptation of dashing from the end of the pathway into the cooling waters of this most refreshing sinkhole. 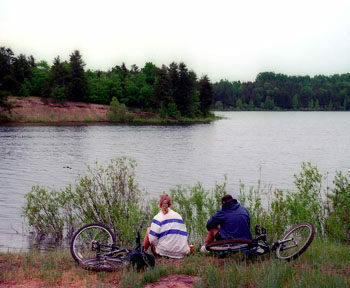 The closest state forest campground to the sinkholes is Shoepac Lake, with 28 rustic sites overlooking the sinkhole lake. The choice of anglers when looking to pitch a tent are the East Unit and West Unit campgrounds on Tomahawk Creek Flooding State Forest Campground, which have a combined 36 sites. Both campgrounds have improved boat launches on the flooding that is fished for bluegill, smallmouth bass and northern pike. Also in the area is Tomahawk Lake State Forest Campground, which features 26 sites, more than half of directly on the lake as well as the best beach and swimming in the area. There are no vehicle fees to hike or bike Sinkholes Pathway but there is a nightly fee to stay in the state forest campgrounds. From M-32 in Atlanta head north 16 miles on M-33 and then east on Tomahawk Lake Highway to reach the campgrounds. Contact the Gaylord office of the Department of Natural Resources (989-732-3541).